Find hotel near Graeme Hall Nature Sanctu .. The Graeme Hall Nature Sanctuary occupying around 42% of Ramsar Wetland System is owned by the Canadian philanthropist Peter Allard. 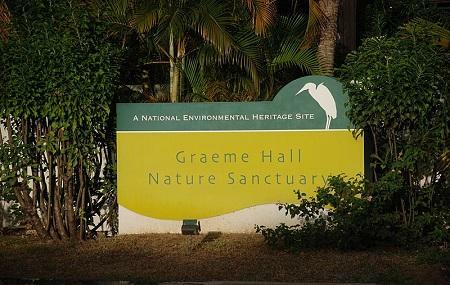 Located in the Christ Church, this eco-tourism site is blessed with the Graeme Hall Mangrove Swamp which is throbbing with extensive flora and fauna. This sanctuary has an abundance of the White and Red Mangroves thriving in the brackish swamp water. The waterlogged grounds are also home to a number of sedges while the lake is home to fishes like Mollies and Atlantic Tarpons as well as Fiddler Crabs. Bats, White Egrets and a plethora of migrating birds flock in Graeme Hall Nature Sanctuary although the place is subject to rapid pollution and illegal poaching. Flamingoes, Scarlet Ibis and St Vincent Parrots are kept in the aviaries.